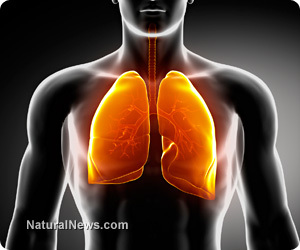 (NaturalNews) COPD is the often used term for "Chronic Obstructive Pulmonary Disease," a rather clumsy and vague description for most of us. It includes a few different lung issues, such as emphysema, bronchiectasis and chronic bronchitis. The scary part is that it's a mystery to our pharmaceutical-dependent medical system. And it gets progressively worse, often leading to death. It's third in disease death rates, behind only heart disease and cancer. COPD creates constricted airways in one's lungs or renders small lung sacks inelastic and unable to fully accommodate breathing cycles; thus, there is obstruction. COPD symptoms include some or all of the following: losing one's breath with minor activity, chronic coughing, increased sputum, chest tightness or pain with difficulty breathing, increased lung infections and fatigue. It has been observed to have four stages. Many of those lugging oxygen canisters around are in the last two stages. The pharmaceuticals prescribed for treating symptoms often have side effects that cause more problems. Big Pharma is still fishing for cures, while COPD diagnoses rates continue rising in our toxic environment. The treatment situation is so bleak and harmful with mainstream medicine that those desperate to breathe normally and cough up less mucus have desperately turned to medical marijuana for at least some relief without negative side effects. Smoking marijuana cigarettes is shunned for obvious reasons, but many claim that vaping, or using a vaporizer to inhale cannabis, is useful for COPD without exacerbating the lungs' inflammatory condition. But better results have been achieved by ingesting cannabis, especially the potent, highly condensed oil extract that Rick Simpson pioneered in Canada and now in Eastern Europe. Many medical marijuana advocates, especially those in medical-cannabis-friendly states, have learned to make the oil and provide it to those in need. Most of the cannabis treatment publicity has gone toward cancer, Crohn's disease, chronic epileptic seizures and glaucoma. Even Parkinson's disease and multiple sclerosis victims have experienced positive results from various cannabis products with THC applications. Pharmaceutical-dependent mainstream medicine hasn't been able to cure any of these diseases or even alleviate symptoms without creating complications, some fatal. More COPD patients have hopped on the cannabis cure bandwagon with positive results lately. These results include folks with late-stage COPD and severe emphysema. At the relatively young age of 36, Jeff Waters was diagnosed with COPD. Eight years later he had to be rushed to an ER during another bout with bronchitis. Lung scarring was discovered, and his condition was raised to stage 2 COPD. While prescribing several pharmaceuticals, the doctor told him that it would continue to get worse and eventually kill him. Jeff did continue to get worse. He was unable to climb a flight of stairs and he wound up with stage 3 COPD and an oxygen canister to prove it. Showering and shaving without his oxygen supply turned out to be almost too arduous of a task. Then an allergic reaction to a prescribed high blood pressure medication put him on life support in ICU with severe pneumonia for a month. After his recovery, he resolved to handle his COPD without mainstream medical interventions. Jeff found COPD sufferers online who had resolved their COPD issues with cannabis oil. He networked with them and found his own sources for cannabis oil. After only two months of using the oil, Jeff went off oxygen and all the pharmaceuticals he had been prescribed. He now walks two to five miles daily and claims that cannabis oil has allowed him "to get his life back."